After almost two months back on the road, I’ve been enjoying the change of environment. While I miss the running community and the races in Malaysia, I’ve adjusted well to the fresh air, running tracks and free water refill stations. Sorry KL friends if I’m making you a tad jealous. I’ve also got used to not looking over my shoulder constantly, on the look-out for muggers on motorbikes. I rarely see a motorbike and have yet to hear of a mugging. Pedal power dominates the two-wheel transport scene and I’d imagine that it’s quite hard to mug someone while balancing on a bike, unless it’s a tandem with an accomplice. That said, yesterday I was viciously attacked while running – by a testoserone-fuelled magpie. I remember noticing the bird out of the corner of my eye, before it swerved up in the air – away from me I presumed. I could see its shadow and was stunned when that shadow, rather than move away, headed straight for my head. The damn bird swooped down and pecked my hat. Talk about a true WTF moment! Thankfully, I was wearing a cap. If 2XU ever needs a spokeswoman for their Magpie-proof peaked caps, I’m their woman. I tried to dodge the menace, but it continued to dive-bomb at my head, stabbing me with its beak. The fact that I could see its shadow heading for me each time totally freaked me out. 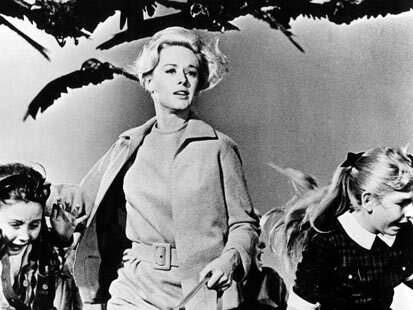 Luckily, the psycho bird which chased me across a four-lane road and back again, much to the bemusement I’d imagine of passing traffic, did not aim for my bare shoulders or my ears. At one point I stopped moving, and the bird just sat on a telephone line looking all innocent. I should point out that this was a suburban residential street and if there was a nest I certainly didn’t hang around long enough to see it. Anyway, as soon as I moved again, swoop and attack, over and over! This was one vicious bird! I eventually outran the feathered fiend – or at least ran out of the territory it was trying to protect. The whole incident lasted just over a minute but left me feeling somewhat rattled. I ran the 6km back to my car which incidentally I’d noticed when parking, was under a tree full of magpie nests. Thankfully this flock hadn’t eaten their crazy worms that morning. Of course, the only thing to do after a traumatic incident such as this, at least when it’s too early to turn to drink, is to turn to Google. It turns out that not only was I not the first victim of magpie assault in Australia, but that magpie attacks are a THING, a big enough thing to merit a WikiHow page entitled HOW TO KEEP SAFE FROM SWOOPING AUSTRALIAN MAGPIES. Apparently, Ozzy magpies are notorious for swooping attacks on runners and cyclists at this time of year which is nesting season. Notorious! Strangely though, no one has mentioned it. So what should I have done yesterday instead of flailing about, panicked by this unprovoked nasty attack? Well besides avoiding that stretch of road, I should have slowed to a walk, and calmly looked the bird in the eye whilst walking backwards. Yes, right, of course. I am genetically incapable of remaining calm in the face of wildlife, so that’s never going to happen. WikiHow recommends carrying an umbrella while walking or running so that it can be deployed as a head protector should a magpie swoop. For cyclists, the recommended protection is a helmet adorned with plastic cable ties when cycling. It doesn’t mention how to protect one’s dignity whilst wearing such headgear but then again, there was nothing remotely dignified about my panic dance yesterday, so it’s probably worth it. You can imagine the danger of falling off a bike or swerving into traffic if a magpie swooped. Interestingly, WikiHow warns that I should ‘not return to the area after the encounter’ as magpies are so smart that the bird will remember me and attack me again. So yes, it was as personal as it felt! Apparently, even looking like me may be enough to trigger the magpie’s ire. 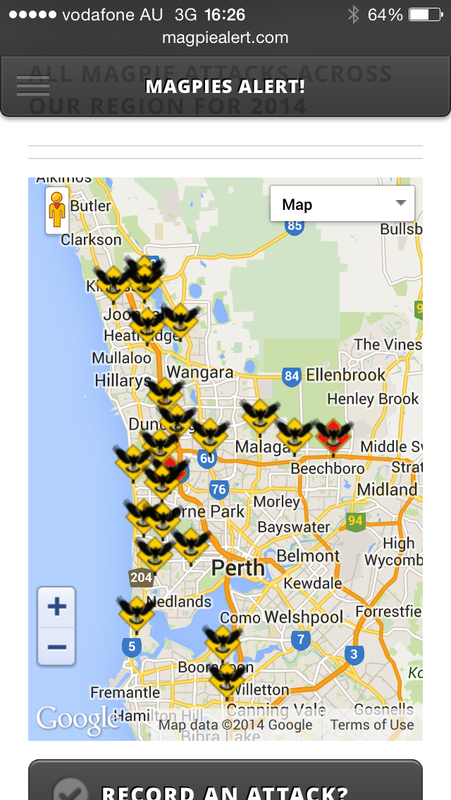 Interactie map of Perth on MagpieAlert.com. Back in KL, I remember people discussing the merits of a website on which people could map muggings, to help mark crime blackspots and alert people to be extra vigilant in affected areas. Well, MagpieAlert.com does exactly the same thing for magpie attacks. Yes, it’s that prevalent! There’s also a Facebook page for the site on which a cyclist posted the clip below of a swooping magpie just like the one that attacked me. So it looks like I’m back to running with one eye on the road (for snakes) and the other in the back of my head (for nasty birds). Oh my poor nerves!